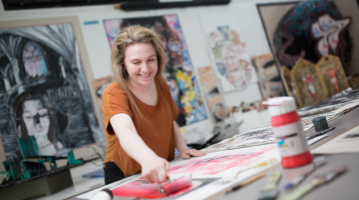 At Hardenhuish School we believe in providing a broad and balanced curriculum which engages and challenges our pupils so that they achieve the best possible qualifications to enable their future aspirations to be fulfilled. The curriculum is designed to offer a diverse and coherent range of courses and learning experiences so that pupils develop skills and knowledge that remain with them long after examinations. This is so our pupils leave school as confident and independent life-long learners, equipped with the transferable skills needed to thrive in a changing world. We place great importance on pupil progress in the core subjects of English, mathematics and science, together with the other English Baccalaureate subjects of the modern foreign languages and humanities. However, Hardenhuish is equally committed to developing pupils’ abilities, talents and enjoyment across the full range of subjects including the design, information and computing technologies, expressive and performing arts as well as sport and physical education. One of our fundamental principles is to offer a personalised curriculum tailored to enable each individual pupil flourish as a learner. Furthermore, Hardenhuish recognises that valuable and often memorable learning also takes place through extra and cross-curricular experiences. 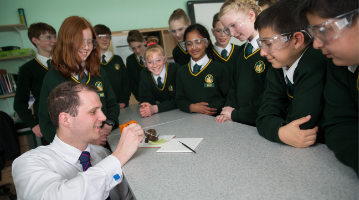 This includes our hugely popular cross-curricular days, such as the ‘Smoothie Challenge’ in Year 7 and ‘Cluedo Investigation’ in Year 8, as well as the vast array of clubs, visits and residential trips. In addition, we also believe in the benefits of promoting the spiritual, moral, cultural, mental and physical development of pupils through our programme of religious, personal, social, health and careers education. This holistic focus enhances the wellbeing of our pupils and helps them to develop as responsible and respectful young adults who make a positive contribution to society. The school operates a one-week timetable for all pupils. There are 25 hours of teaching time, spread across the different National Curriculum subjects. Each day, lessons are organised into six 50 minute slots. Lessons for some subjects are 50 minutes long, such as ICT, mathematics and modern foreign languages. Others are taught in combinations of 50 minute and 100 minute slots, with practical subjects generally preferring the double session of 100 minutes.